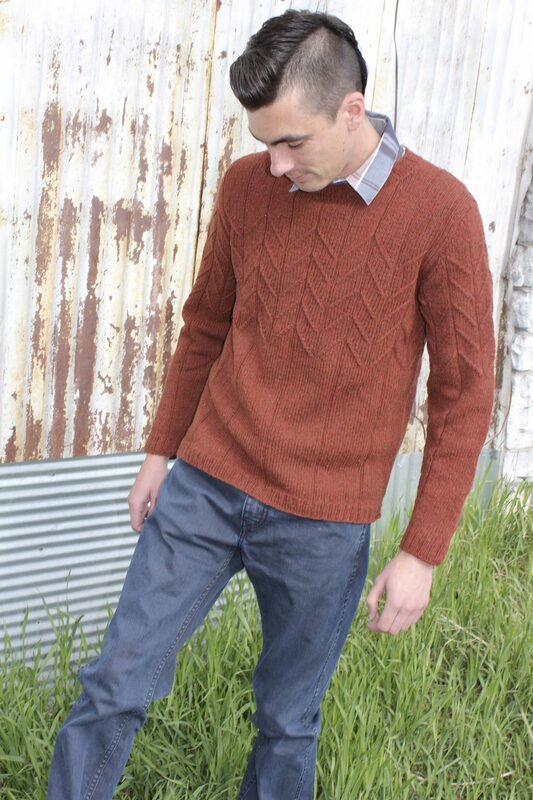 This pullover is my answer to a sweater design that’s interesting to knit but not too fancy for males who prefer “plain” sweaters. Wide ribs give way to a chevron pattern worked with twisted stitches–no cable needle necessary! The body is worked in rounds from the hem to the armholes, then the back and front are worked separately in rows to the shoulders. Stitches for the sleeves are picked up around the armholes and the sleeves are worked in rounds down to the cuffs. There are no seams to sew. The heathery Brooklyn Tweed Shelter shown here provides a warm, rugged fabric.